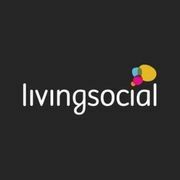 Are you looking for a LivingSocial sales, discount, voucher code or deal? Here are the best shared by our community of bargain hunters. 3 Piece Designer Rattan Dining Set - 2 Colours! WiFi Security Doorbell - 2 Colours! Fitstep A6 Smart Watch - Android & Apple Compatible! Russell & Hobbs Non-Stick Copper Induction Pans - 3pc Set! USB Heated Unisex Coat - 6 Sizes! Great for Cold Weather! Personalised Canvas with Brass Hanger - 6 Options! Cheap 48 Nescafe Dolce Gusto Pods - 4 Flavour Options! 1-3nt Warner Bros Harry Potter Studio Tour & London Trip - 3* or 4*! LivingSocial was launched in 2007 and is owned by Groupon. It’s a marketplace that allows its registered users or members to purchase and share things to do in their city. In 2013, they have reached around 70 million users. The company was originally known as Hungry Machine with just four employees from Revolution Health Group. Their first major application was their Visual Bookshelf app on Facebook which allowed users to catalogue and share their favourite book with their friends. Later, they released PickYourFive and other Polls apps, making them the number one application developer on Facebook as measured by page views. In 2009, they were acquired by BuyYourFriendADrink.com and LivingSocial launched a daily deals website, which since has become its highest grossing venture to date. Today, the marketplace provides a trusted, convenient source for finding value on everyday items an activities as well as identifying novel, enriching and fun experiences for their members to enjoy and share with their friends. Here at LatestDeals you will find value for your money with our LivingSocial sales, offers, deals, voucher codes and coupon codes posted and verified each month by our massive community of bargain hunters! A message of hope and support from LivingSocial employees. LivingSocial offers thousands of unique and diverse offers every day, they inspire their members to discover everything from weekend excursions to international travel, from exclusive gourmet dinners to family outings and more. They help local and national businesses grow by introducing them to new, high-quality customers. They deliver compelling and cost-effective marketing solutions for businesses large and small and provide their partners with the tools to make their members their regulars. How do I contact LivingSocial? You can find the answers for common questions and enquiries on their FAQ’s. Alternatively, if you can’t find the answers you are looking for, you can raise any queries using their Online Contact Form. You can also speak with their Live Chat advisors from Monday to Friday between 9am-5:30 pm. Twitter and Facebook queries are answered between 8am-4:30 pm from Monday to Friday. You can call them on 0203 308 9279 from between 9am-5:30pm from Monday to Friday. What are the delivery options for LivingSocial? Once you’ve ordered a voucher, they will send a receipt straight away. You'll then be sent an email containing your voucher code and full instructions on what to do next. For example, if you buy a restaurant offer, they will include contact details to enable you to book your table. If you buy a product that requires delivery, they will send you a link to the merchant's website where you can enter your code and delivery address. Your voucher is in PDF format attachment and may be sent to your spam folder. If you haven’t received your voucher yet, you can also find it by logging in to your account at secure.livingsocial.co.uk/login. Next to each voucher is a "view voucher!" button which can be used to download the voucher. How do I return an item to LivingSocial? They also offer a no-quibble 14 day money back guarantee on all unredeemed vouchers (starting from the day after the day you receive your voucher) whereby if you originally paid in cash, you can receive a 100% cash or 100% Deal Credit or, if you paid using Deal Credit, you can receive a 100% Deal Credit. Cash refunds could take up to 10 days to process while Deal Credit is usually applied instantly, subject to qualifications. All refunds requests must be made using their Refunds Form. Refund requests received 15 days or more after the day after the day you received the voucher are considered on a case by case basis.